In the television series “Charmed,” she portrayed a character with the power of premonition, and now thanks to actress Alyssa Milano a South Korean dog who was facing her fate can see that she has a bright future ahead of her. Suffering from sores and mange and chained to a pole, unable even to step inside her doghouse or protect her pups who perished from exposure to the elements, a Jindo-mix dog called Bomi (the Korean word for ‘spring’) who was being raised for consumption had experienced life’s coldness, but just like the season she was named after Bomi would soon blossom with help from a team of caring animal lovers. 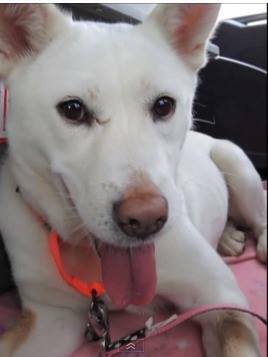 Contacted by the South Korean animal rescue organization CARE, The Fuzzy Pet Foundation was able to transport Bomi to the U.S. as a result of aid from Alyssa Milano, who paid for the flight, Radar Online reports. Having healed from her physical and emotional wounds in the home of a loving foster family, Bomi is now hoping to find her own forever pet parent. Anyone interested in adopting Bomi can email info@tfpf.org. Based in Santa Monica, California, The Fuzzy Pet Foundation has rescued dogs and cats in need, helped to curb the problem of pet overpopulation through spay/neuter efforts and promoted compassion toward companion animals since its founding in 2005.